For the first time in team history, the Lehigh Valley IronPigs have made individual tickets to all of a season's Friday night fireworks games available before "Pig Day." 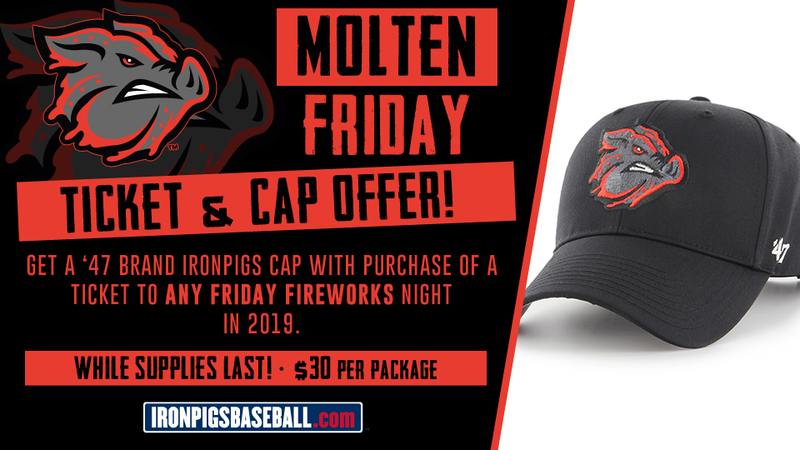 Via this special offer, fans can get a ticket to any 2019 Friday evening contest and a '47 Brand IronPigs cap for just $30. Click on the game date/opponent below to secure your seats and cap today! Contact the Coca-Cola Park ticket office at (610) 841-PIGS (7447) if you have any questions or would like more information. The IronPigs have a number of Bacon, USA membership plans and special themed ticket offers available for the 2019 season. Single-game tickets will be available Saturday, March 2 during the team's annual "Pig Day" celebration at Coca-Cola Park. The 2019 IronPigs season is the team's 12th as the top affiliate for the Philadelphia Phillies and 12th at Coca-Cola Park. Bacon, USA, membership plans are now available and feature IronPigs tickets, as well as parking discounts, on-field VIP access to batting practice, special event invitations and more! Learn more by calling 610-841-PIGS (7447) x3 or by visiting PigsMemberships.com.